Think it’s difficult to own a forum? Now, you can create your forum by Turbo Station. Follow the steps below and you will find out how easy it is. Note: Please go to www.qnap.com to download the new firmware* with built-in phpMyAdmin. Then upgrade your server with the new firmware. You can go to administration/ System Tools/ System Update to update the firmware or refer to the user manual for the firmware upgrade details. * TS-109/209 firmware v1.1.0 build 0830 or later versions support built-in phpMyAdmin function. First, enable web server and MySQL server. 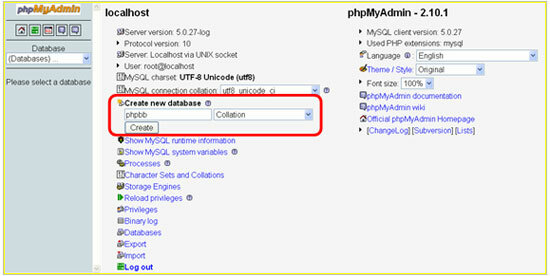 You can then use the built in MySQL management tool- phpMyAdmin. Make sure your Turbo Station is ready. You can use QNAP Finder to configure Turbo Station step by step. Then, login Turbo Station. Make sure Web Server and MySQL Server are enabled. Follow the steps below to enable MySQL Server. A. Go to Web Server of Network Settings, enable the Web Server function and input your SMTP Server. You can also enable SMTP authentication for your mail server when necessary. B. Go to MySQL Server of Network Settings and enable MySQL Server. Note: If you do not find the phpMyAdmin link on MySQL Server page, please go to www.qnap.com to download the NAS firmware with built-in phpMyAdmin. Then upgrade your server with the new firmware. A. Go to the built-in phpMyAdmin page http://”Turbo Station IP Address”/phpMyAdmin/ (phpMyAdmin is the default folder name in Qweb); and enter the user name and password to login. You can also select your local language. B. After login successfully, you can enter the phpMyAdmin management page as shown below. After login phpMyAdmin, you should know how to change the root password, create a database, and add users to the database. 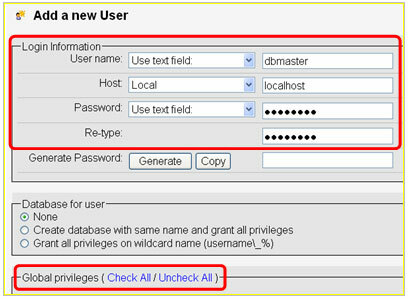 Change your root password to secure your database as shown below. A.	Click in phpMyAdmin management page to edit Privileges of root. B.	Click to edit the password of root in localhost. Click to save the changes. You should use the new password to login afterwards. 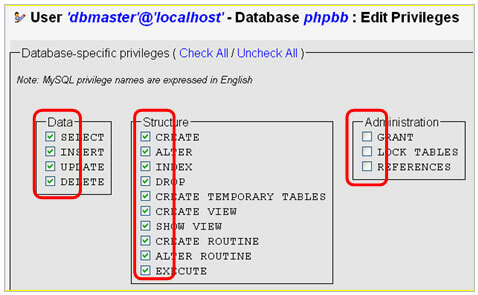 You can create a database user for specific database and define the privileges of the user. A.	Click in phpMyAdmin management. Then, click “Add a new User“. B. Input the user information. Then, click to complete. There are four options when you click on the drop-down menu of “Host“, which are Any Host, Local, user host table, use text field. Any host shows the default setting “%“; Local shows the default setting “localhost“; user host table allows users to enter IP address or domain name. For general use, “localhost” is recommended, because “localhost” is only for connection of this NAS server. If you choose user host table and input IP address or domain name, that means this user can access the server remotely from that IP address or domain name. Note2: Do not check all items in Global privileges unless you want to use this new user account instead of “root“. A. Input a database name, e.g., phpbb as shown below. Click to create a database. B. The database has been created on the list. A.	Click to return to phpMyAdmin homepage. Then click to edit user’s privileges. B.	Click to edit the privileges of the dbmaster. Find the “Database-specific privileges”. C.	Select the database, e.g., phpbb. The next page is shown automatically. D.	Select privileges for data, structure, and administration. Then, click to complete. Note: For common use, it is recommended to check the “Data” and “Structure” items in Database-specific privileges. When you have successfully set a user’s privileges for this database, the following message is shown. Right now, you can easily build a PHP+MySQL forum on Turbo Station, e.g., phpbb. Let’s use phpBB for practice below. A. You should download the phpBB program first. You can download it directly from this URL: http://jaist.dl.sourceforge.net/sourceforge/phpbb/phpBB-2.0.22.zip. If you want to know more information or download other versions, please refer to http://www.phpbb.com. B. 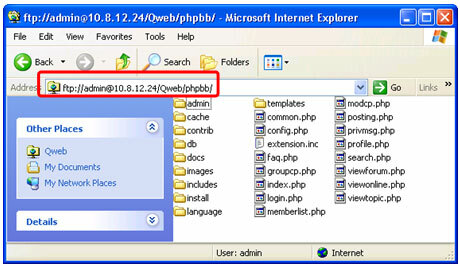 Create a folder under the “Qweb” network share folder, e.g., phpbb. 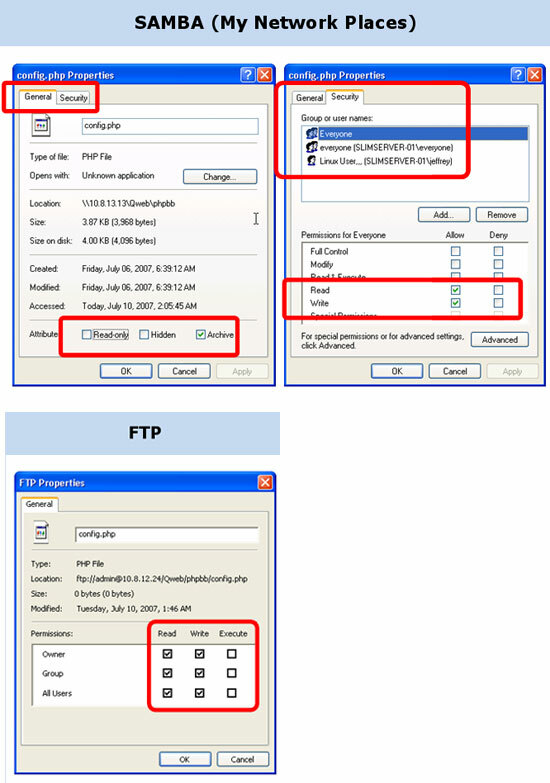 Extract the downloaded files to the folder, e.g., Qweb/phpbb via FTP as shown below. C.	Make sure the permissions of the Qweb/phpbb/config.php file is “read” and “write”. You can configure the permission by FTP or SAMBA (My Network Places). A. Go to the phpBB Page in http://”QNAP NAS server IP Address”/phpbb/ (phpbb is the name of the folder created to upload all extracted phpBB files) and install it. Input all the necessary information, and click . 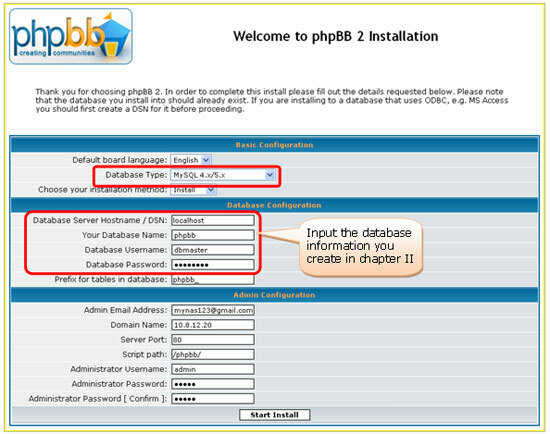 C.	After installation completes, delete or rename the /Qweb/phpbb/install/ and /Qweb/phpbb/contrib/ directories. 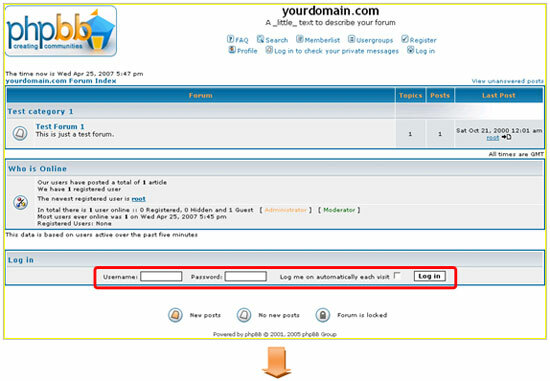 Go to the phpBB page http://”QNAP NAS server IP Address”/phpbb/ to access your forum. 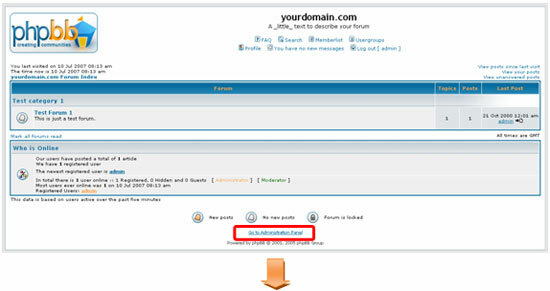 Login as the administrator to manage your forum. Login as an administrator, and then click Go to Administration Panel. You can manage your forum over here!